Multidisciplinary or post-disciplinary research is what is needed when dealing with such complex subjects as ritual behaviour. This research, therefore, combines ethnography with historical sources to examine the relationship between modern Greek death rituals and ancient written and visual sources on the subject of death and gender.The central theme of this work is women's role in connection with the cult of the dead in ancient and modern Greece. The research is based on studies in ancient history combined with the author's fieldwork and anthropological analysis of today's Mediterranean societies. 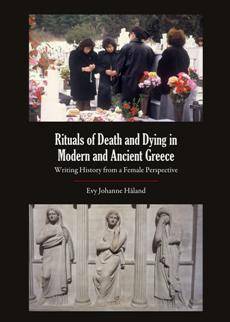 Since death rituals have a focal and lasting importance, and reflect the gender relations within a society, the institutions surrounding death may function as a critical vantage point from which to view society. The comparison is based on certain religious festivals that are dedicated to deceased persons and on other death rituals. Using laments, burials and the ensuing memorial rituals, the relationship between the cult dedicated to deceased mediators in both ancient and modern society is analysed. The research shows how the official ideological rituals are influenced by the domestic rituals people perform for their own dead, and vice versa, that the modern domestic rituals simultaneously reflect the public performances. As this cult has many parallels with the ancient official cult, the following questions are central: Can an analysis of modern public and domestic rituals in combination with ancient sources tell the reader more about the ancient death cult as a whole? What does such an analysis suggest about the relationship between the domestic death cult and the official? Since the practical performance of the domestic rituals was – and still remains – in the hands of women, it is crucial to discover the extent of their influence to elucidate the real power relations between women and men. This research represents a new contribution to earlier presentations of the Greek “reality”, but mainly from the female perspective, which is highly significant since men produced most of the ancient sources. This means that the principal objective for this endeavour is to question the ways in which history has been written through the ages, to supplement the male with a female perspective, perhaps complementing an Olympian Zeus with a Chthonic Mother Earth. The research brings both ancient and modern worlds into mutual illumination; its relevance therefore transcends the Greek context both in time and space.